Modern Multiples presents their new Street Art featuring over 80 different limited edition serigraphs from over 10 graffiti and street artists, such as Chaz Bojorquez, Gajin Fujita, Speedy Graphito, Defer, and Saber. Modern Multiples is a fine art printmaking studio specializing in serigraphs and digital giclees. They collaborate with a wide array of contemporary artists and designers to create unique and highly collectible works of art. Each production is unique in its progression through the different levels of involvement and participation of the artist and publisher. Creating a Street Art Section is a way of celebrating independence and the Freedom of Artistic Expression. 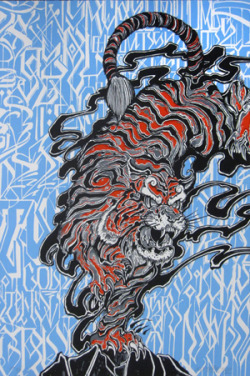 Many of the Street Art prints are done on Coventry Rag 320gsm including the image to the left, Defer "Treading on a Tiger's Tail". Coventry is internally sized with a modest amount of surface sizing so while it’s predominantly used for serigraphy, it’s also making a great choice for fine art offset lithography. Discover more or purchase Modern Multiples Street Art here!